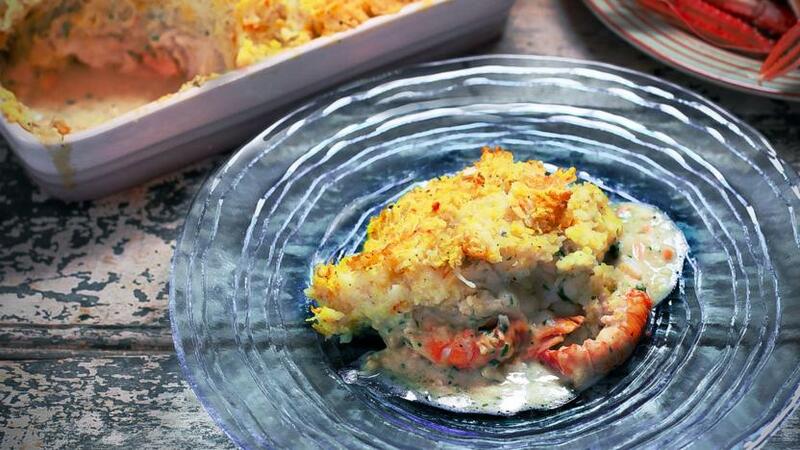 A fish pie, I think, always needs a bit of smoked fish to really make it taste good and what could be more luxurious than smoked Scottish langoustines? If you can’t get hold of any, use giant tiger prawns instead, and replace half of the plain haddock with smoked haddock. Equipment and preparation: for this recipe you will need a large ovenproof dish, about 2.5 litres/4 pints 7fl oz capacity. For the poaching stock, place all the ingredients in a large pan and bring to the boil. Reduce the heat to a simmer. Add the haddock and salmon to the stock, pressing them down gently into the simmering liquid. Poach the fish for a few minutes, or until just cooked. Strain the mixture, reserving all the liquid. Pick out the stock vegetables and bay leaf and discard. Leave the fish to cool. Put the strained poaching liquid into a clean pan. Bring to the boil, and boil until the volume of liquid has reduced by half. You will need 300ml/10½fl oz of the reduced liquid for the sauce. Set aside. For the mash, put the potatoes in a large pan. Cover with cold water, add a little salt and bring to the boil. Cook for 15–20 minutes, or until tender. Meanwhile, to make the sauce, melt the butter in a pan. Stir in the flour to form a roux. Let this cook over a medium heat, stirring frequently, for 2–3 minutes. Take off the heat and gradually add the reduced poaching liquid, a ladle at a time, beating well after each addition to create a smooth sauce. Return to the heat and cook, stirring often, for about five minutes. Finish the sauce by adding the cream, tarragon and some salt and pepper. Drain the potatoes well and set aside. Heat the cream, saffron and butter gently in the potato pan, until the butter has melted, then take off the heat and pass the potatoes through a ricer into the pan (or just tip them in and mash). Season with salt and pepper to taste and stir to combine. Flake the cooked fish over the base of your ovenproof dish, taking care to remove any bones as you go. Scatter over the langoustines. Pour over the sauce. Top with the mash, smooth it down and then mark into a scallop pattern with the tip of a pallet knife, or the handle of a large spoon. Bake for 25–30 minutes, or until golden-brown on top and bubbling all the way through. If your assembled pie has cooled down, it may take longer. Serve with buttered peas.